2019. Contesting Inequalites, Identities and Rights in Ethiopia. London/New York: Routledge. 2008. Rural Livelihoods and Social Differentiation in Dawro, Southern Ethiopia. Addis Ababa: Department of Sociology and Social Anthropology. 2018. “Land Disputes and Remediable Injustice in Ethiopia,” in E.Uwazie, ed., Peace & Conflict Resolution in Africa: Lessons and Opportunities. Cambridge: Cambridge Scholars Publishing. Pp. 99-115. 2012b Review of “Hope is Cut: Youth, Unemployment, and the Future in Urban Ethiopia”, Daniel Mains, Temple University Press, 2011. American Ethnologist 40(2): 401-402. 2011 "The Family Connections: Inherited Status and Parliamentary Elections In Dawro, Southern Ethiopia," in K. Tronvoll & T. Hagman, eds., Contested Power in Ethiopia. Boston/Leiden: Brill publishers. Pp. 89-109. 2010a. “Governance, Language Politics, and Education in Southern Ethiopia: The Tribulations of Inventing WoGaGoDa”, in M. Kebede and P. Milkias (eds. ), Education, Politics and Social Change in Ethiopia. Hollywood, CA: Tsehai Publishers. Pp. 117-128. 2010b. “Extended Case Method” In A.J. Mills, G. Durepos, E. Wiebe (eds. ), Encyclopedia of Case Study Research. Thousand Oaks: Sage Publishers. Pp 374-76. 2008. “Changing Youth Religiosity in Ethiopia: A Generational Approach” in Alber, E., S. Van der Geest and S. Whte (eds. ), Generations in Africa: Connections and Conflicts. Berlin: Lit. pp.311-33202007. 2007a. Rural Livelihoods and Social Differentiation in Dawro, Southern Ethiopia. Addis Ababa: Department of Sociology and Social Anthropology. 2007b. ‘New Religiosity and Changing Intergenerational Relations in Ethiopia’. In E. Alber, S. van der Geest, & S. R. Whyte (eds. ), Generations in Africa: Connections and Conflicts. Hamburg, Münster: Lit-Verlag. Pp. 377-399. 2006a. ‘Enduring issues in State-Society relation in Ethiopia’, International Journal of Ethiopian studies. 1(2): 141-159. 2006a. Review of Eva Poluha’s book The Power of Continuity: Ethiopia through the Eyes of its Children. Nordiska Africanistitututet, 2004. Ethnos 71(2): 280-282. 2005a ‘Clans, Kingdoms and Cultural Diversity in Southern Ethiopia: the case of Omotic Speakers.’ Northeast African Studies Journal. 7(3): 163-188. 2005b ‘Christianity and Spirit Mediums: Experiencing post-socialist Religious Freedom in Ethiopia’, Max Planck Institute for Social Anthropology, Halle/Saale, Germany, Working Papers no. 75. PP. 1-29. 2005c. ‘Civil Society and Religious Difference: Note on Gutara Institution in Walaita, Southern Ethiopia’ In Brigitta Benzing, ed. Civil Society in Ethiopia: Reflections on Realities and Perspectives of Hope. African Asian Studies Promotion Association. Frankfurt am Main: Verlag fur Interkulturelle Kommunikation. Pp. 41-58. 2005d. ‘Dawro’ in Siegbert Uhlig, ed. Encyclopedia Aethiopica, Vol. 2 . Wiesbaden: Harrassowitz. pp. 114-115. 2004a. (Jointly authored with Gunnar & Randi Haaland), ‘Furnace and Pot: Why the iron smelter is a big pot maker: a case study from southwestern Ethiopia’. Azania XXXIX.:143-16. 2004b. (Jointly authored with Gunnar & Randi Haaland), ‘Smelting Iron: Caste and Its Symbolism in South-western Ethiopia. In T. Insoll, ed., Belief in the Past. The Proceeding of the 2002 Manchester Conference on Archaeology and Religion. BAR International Series. PP. 75-86. 2003a. (Co-authored with Ian Scoones), ‘Networks of Knowledge: How Farmers and Scientists Understand Soils and their Fertility, A Case Study from Southern Ethiopia’. Oxford Development Studies. 31(.4): 461-478. 2003b. (Coauthored with Behailu Abebe), ‘Dawro (on indigenous minorities)’ In D.Freeman and A. Pankhust, eds.,Living on the edge: Marginalized minorities of craft workers and hunters in Southern Ethiopia. Hurst, London; also published by Addis Ababa University press, 2001. 2001. (Jointly authored with others), ‘Creating Gardens: The Dynamic of Soil-Fertility Management in Wolaita, Southern Ethiopia’ In I.Scoones, ed., Dynamics and Diversity: Soil Fertility and Farming Livelihoods in Africa. London: Earthscan Publications Ltd.
2000b. (Jointly authored with Randi and Gunnar Haaland), ‘Ethno-Archaeological Research on Iron smelting in Southwest Ethiopia’. NYAME AKUMA: Bulletin of the Society of Africanist Archaeologists. 1998. ‘Soil Fertility Management in its Social Context: A Study of local perceptions and Practices in Wolaita, Southern Ethiopia’. Managing Africa's Soils. Vol. 1 no. 1 pp. 1-30. Shifting Grounds: The New Context of Contesting Land Rights, Governance and Social Justice in Ethiopia, paper presented at the 59th Annual Meeting of African Studies Association Imagining Africa. Conference Theme: At the Center: Bridging Scholarship, Policy, and Representation In African Studies, Washington, D.C., December 1 - 3, 2016. Uncommon Grounds: Social Justice and Land Disputes in Southern Ethiopia, paper presented at the 25th Annual Africa/Diaspora Conference of Center for African Peace and Conflict Resolution. Conference Theme: Peace & Conflict Resolution in Africa, 25 Years Later: Lessons, Best practices, and Opportunities. Sacramento, California, April 20-23, 2016. 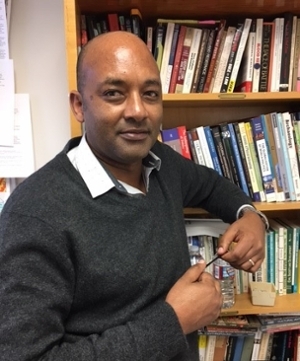 Christianity’s Moral Dilemmas in a Hybrid Neoliberal Context: Relational Analysis of Struggle for Religious Equality in Ethiopia, paper presented at 2015 Biennial Meeting of Society for the Anthropology of Religion, San Diego, CA, April 16-19, 2015. Negotiating Sacred Boundaries: Youth and Religious Activism in Ethiopia. Paper presented at the 111th Annual Conference of American Anthropological Association held at the San Francisco Hinton Hotel, Nov. 20-24, 2013. Pentecostal Youth and Political Discontent in Ethiopia’s South. Paper presented at The 21st Annual African/African Diaspora Conference, held at CSUS, 26-28 April 2012. Local Governance and Human Rights in New Ethiopia. Paper presented at the 53rd Annual Meeting of African Studies Association, November 18-22, 2010, Westin St. Francis Hotel, San Francisco, CA. ‘Good Governance’ and ‘Bad culture’ in Ethiopia. Paper presented at the 108th Annual Conference of American Anthropological Association. Philadelphia, Dec. 2-6, 2009. Generational Rupture? Faith, Youth and Social Conflict in Ethiopia. Paper presented at the 2008 annual Conference of Canadian Anthropology Association. Held at Carleton University, Ottawa, 8-10 May 2008. The Equality Agenda and Neoliberal Rights in Ethiopia. Paper presented at the 106th Annual Conference of American Anthropology Association. Conference theme: (In)equality, Difference and Justice. Held in Washington DC, November 28-December 2, 2007. The Generations: new religiosity and societal peace in Dawro, Southern Ethiopia. Paper presented at the workshop New Religiosity and Inter-generational Conflict in Northeast Africa, Organized by Data Dea, Gunther Sclee, and Christiane Falge,Max Planck Institute for Social Anthropology, Halle, Germany. April 26-28, 2006. The Power of Land: Shifts in Land Tenure and Social Conflict in Southern Ethiopia. Paper presented at the 2005 Annual Meeting of African Studies Association, Session (IV-M6): The Politics of Land: Flexibility and Change within African Systems of Land Tenure, Part II. Washington, DC, November 17-20, 2005. Religiosity and Morality: the post-socialist disquiet in Ethiopia. Paper presented at the Annual Conference of Society for Anthropology of Religion. Religion, Ethics and Morality: Coextensive, Complementary or Conflicting? Vancouver, Canada, April 8-11, 2005. Managing Diversity? A Note on the ‘WoGaGoDa’ Politics in Omotic Speaking southwest Ethiopia. Paper presented at the XVth International Conference of Ethiopian Studies, University of Hamburg, Germany. July 21-25, 2003. Land in Majority-Minority Relations in Dawro, Southern Ethiopia. Paper presented at the workshop: The Landed and the Landless: Strategies of Territorial Integration and Dissociation in Africa, Halle, Germany, 27-29 March, 2002. Indigenous Knowledge and Social Inequality: reflection on cultural practices in Dawro, Southern Ethiopia. A paper presented at the Workshop Indigenous Knowledge Systems in Ethiopia; Organized by the Ethiopia Chapter of OSSREA, Addis Ababa, Ethiopia, January 10, 2000. The Dynamics of Indigenous Institutions and Sustainability of Livelihoods in North Omo, Southern Ethiopia. A Paper Presented At The Workshop ‘The Role Of Indigenous Institutions and Associations in Development, Organized by the Ethiopian Association of Sociologists, Anthropologists and Social Workers, ADDIS ABABA, June 25-26, 1998. Socio-Economic Factors Affecting Soil Fertility Management in Kindo Koysha, Southern Ethiopia. Paper presented at Workshop ‘Nutrient Cycling and Soil Fertility Management in Africa. Organized by FARM Africa and International Institute for Environment and Development (U.K) ”, Wolaita Soddo, Ethiopia, 26 November - 2 December, 1995. The State of Land Rights, Governance, and Conflicts in Africa: Case Studies from Ethiopia and Mozambique, panel at at the 59th Annual Meeting of African Studies Association Imagining Africa. Conference Theme: At the Center: Bridging Scholarship, Policy, and Representation In African Studies, Washington, D.C., December 1 - 3, 2016. Transitions and Transformations: Ethiopian Case Studies on Shifting State Powers and Citizens’ Reactions” at the 53rd Annual Meeting of African Studies Association, November 18-22, 2010, Westin St. Francis Hotel, San Francisco, CA (Jointly organized with Teferi Abate, Yale University and Worku Nida, UCLA). Co-organized (with G. Schlee, and C. Falge) the conference on “New Religiosity and Inter-Generational Conflict in Northeast Africa. At Max Planck Institute for Social Anthropology, Halle, Germany, April 26-28, 2006. Political Anthropology: State-society relations, civil society and good governance, human rights and justice, inequality and conflict, cultures of conflict resolution, ethnicity and nationalism. Anthropology of Religion: Religion and identity politics, New Religiosity and Conflict, Religion and (in)tolerance; new religious movements and youth, religion and international migration. Development: Science, new technology and Society; Indigenous knowledge, science and power; sustainable livelihoods and resource management; land rights and state policy. My main ethnographic research region is southern Ethiopia/Horn of Africa. I have also carried out field research in Mali, Germany and USA.